BELIZE CITY, Fri. Apr. 10, 2015–On Easter Monday, April 6, a Coast Guard vessel was returning to base after a multi-agency operation around San Pedro, but before the boat docked, there was a shooting on board and Keyren Tzib, 24, who is employed in the Belize Coast Guard as a “seaman,” was arrested and charged for the shooting. Tzib was arraigned on attempted murder and two related criminal charges when she appeared before the Chief Magistrate on Tuesday. She was remanded to prison and has to apply to the Supreme Court for bail. Having completed the necessary paperwork, this morning, Tzib and her attorney, Audrey Matura-Shepherd, appeared before Supreme Court Justice Herbert Lord to argue the bail application. Justice Lord, therefore, after making certain orders, indicated to the parties that he will rule on the bail application at 2:00 p.m. on Wednesday, April 15. Police charged Tzib with the attempted murder of Coast Guard Petty Officer Kurt Hyde, who was shot with an M-4 Carbine rifle. Hyde was the captain of the boat in which he was shot. When the vessel was about 100 yards from the Coast Guard headquarters, a single gunshot was heard and he was subsequently seen bleeding on the floor. He had been shot in the back of the head and the bullet exited through his face. In connection with the incident, Tzib was also charged with “dangerous harm” and “use of deadly means of harm,” offences which will be heard on indictment in the Supreme Court. 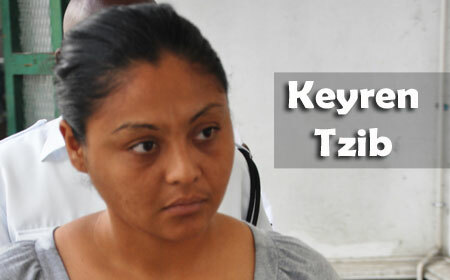 In the bail application she submitted on behalf of Tzib, Matura-Shepherd used the amendment to the Crime Control and Criminal Justice Act to move the court to hear the application at the earliest possible date. Under the amendment to the law, accused persons do not have to wait two weeks if they can prove their “good character,” and that they have no criminal record. Willis, in opposing the bail application, told the court that he was only served with the notice yesterday, Thursday, and that he did not have enough time to get all the details in order. Willis, however, was able to tell the court that the virtual complainant, Hyde, is still hospitalized in a critical but stable condition. Willis added that Hyde would undergo surgery onboard a visiting US Navy medical ship on Sunday, April 12. The ship is currently docked in the Belize City harbor. “My Lord, this is the state against an individual. The state has resources I don’t have,” Matura-Shepherd told the court. “The lack of diligence on the part of the Crown should not be used to prejudice the applicant in this matter,” Matura-Shepherd further submitted. “What I do want to impress on the court is the power it has to grant bail,” she went on to state. “There is enough evidence before the court that this is not an idle citizen. This is a productive citizen,” Matura-Shepherd continued. At the end of the submissions, Justice Lord ordered that Tzul “undergo a psychological evaluation by the medical doctor at the Kolbe Foundation” and that the report be sent to him on or before April 15 so that he can make a decision. Justice Lord also asked for an update on the condition of Hyde, the virtual complainant. “For me, it’s very simple. I’ve worked at the DPP’s office and you have to work overnight; you have the resources of the State; they have access to the police, anyone they want to, to get an affidavit. An affidavit is the most basic thing and an attorney needs to be able to prepare and file. But they presented absolutely no evidence to the court,” Matura-Shepherd said.